Fake Internet Service Provider: Phone Scam Alert! “Hello. This is Verizon. We need to inform you that someone is using your IP address for illegal activity.” Thus begins yet another phone scam, which a recent customer made known to us. We’ve previously notified you of the Windows Expiry scam. This fake Internet Service Provider scam has many similar qualities, as well as a few other tricks. A live representative called a resident claiming to be their Internet Service Provider (ISP), which would be a company like Verizon, Comcast, or Service Electric. The Windows Expiry scam began with a prerecorded message and provided a number to call, but a live person placed the ISP call. Often the people behind these charades operate from out of the country, but the customer’s caller ID read Camden, NJ. The representative claimed that someone else was using the customer’s IP address for illegal activities. Using techy buzzwords that average computer users don’t understand and frightening words like “illegal,” unsettles individuals. As with scareware warnings on a computers, users often begin to panic and stop thinking clearly as the call continues. Claiming he needed to investigate the problem, the scamming representative guided the user through some steps to take control of the computer remotely. He pulled up windows and notices that were supposedly part of this repair process. At the beginning, the representative said the services were free. 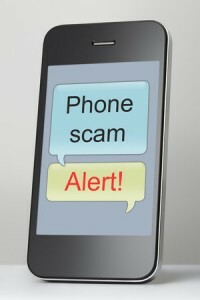 Usually, at some point in scam calls, the representative will ask for payment or try to sell something. However, this caller also said that the customer would receive $200 back from the phone company for the problem. During the call, the scammer tried to pull up sensitive information, such as email and banking accounts, to steal information and funds. Ultimately, the representative said that he was unable to resolve the issue remotely and would have to send someone out to the home the next day to replace the Verizon box (modem) because it had expired. After becoming suspicious and hanging up, the customer received further phone calls from the same party, but did not give them any more information. It’s obviously upsetting to hear words like “illegal activity” and feel bewildered by a tech problem you don’t understand. However, thinking through this phone call, many strange signs become apparent. ISPs like Verizon and Comcast rarely initiate contact. Customers would have to contact them first with a problem. When a customer calls, companies have questions to help verify your identity. These steps did not take place in the scam call, but often scammers do fish for information. Be careful not to give anything away if you doubt that they’re legitimate. Should a company representative call, they would identify themselves by company, either by name or customer service identification number. If they say, “This is your Internet Service Provider,” ask them to identify the company by name. Do not reveal it yourself. A busy company like Verizon would unlikely be able to schedule a home visit the day after a call. When they do schedule it, they give themselves a three-hour window of arrival time. Do you really think Verizon would offer a $200 refund? Do not let yourself be rushed or pressured into any sudden decisions. Tell the caller you do not have time to address the issue right away. Take down their name, representative ID number, phone number, and a case reference number. Check if the call is legitimate by calling your ISP (or other relevant company) using a phone number from a bill or other official communication. Do not return the call on the number given by the first party that contacted you. If it was legitimate, your case can be transferred/handled at that point. If not, you have saved yourself a lot of trouble, as well as notified the service provider that scammers are impersonating them. Once you’ve confirmed a caller is a scammer, do not take any more calls from them. If they continuously call and you answer, tell them you know they are not legitimate and you have reported them to the proper authorities. That should stop the calls. Previous post / Stay in CTRL: Computer Crash (Not) Immanent! "Good local business. Quick, quality and affordable work. Highly recommended." © PC Ninja 2016-2020. All Rights Reserved. This website is governed by our Disclaimer, Copyright, Terms and Agreements and Privacy Policies.